They bill it as a “Special Event” maybe because it is the first production in Broadway’s oldest theater, the painstakingly re- renovated 100 year old Hudson Theater. Its muted atmosphere a strange foil for a show devoted to color. Those alone don’t make it special. What does is the show itself. Did you ever hear a painting sing? That is exactly what happens in the glorious climax of the first act as we have witnessed the very disciplined, both artistically and emotionally, young George Seurat, who, in 1893 was first ridiculed and later revered for his Post Impressionist technique of Pointillism, a rather scientific approach to the creative process in which individual dots of different colors on the canvas merge in the eye of the beholder to form the original brighter color the artist intended. echoes the process musically in the precise, staccato, controlled phrasing that identifies his music from others. It’s literally mind over matter in both cases. James Lapine’s lean book combines them both. 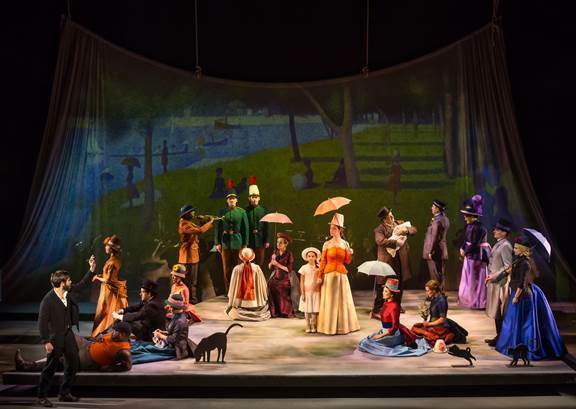 Jake Gyllenhaal certainly walks comfortably in the celebrated shoes of Mandy Patinkin, the George Seurat role’s creator in l984. It is a tour de force for his broad range of vocalizations from full throated to floating, a true musical theater star. We meet young George, a familiar sight, 1884 to1886, in a park just outside Paris, where he painted the strollers and locals parading there. He is working on his future masterpiece “A Sunday Afternoon on the Island of La Grande Jatte”. Leading the parade and his principal subject is his adoring mistress/model Dot (Annaleigh Ashford) frustrated in the knowledge that George appreciates her more as a model than in the flesh, an unhappy situation made more obvious as he turns away from her when she births his child, a daughter she calls Marie. Reaffirming the remoteness of his character is George’s mother,(the wonderful Penny Fuller) who endures and echoes his detachment from basic human bonds, watching him prefer his relationship to the strangers he depicts in his careful compositions. the brutal one-eyed boatman (Philip Boykin), the playful nurse (Jennifer Sanchez), “everybody loves Louis” (Jordan Gelber), two giddy girls (Jenny Barber and Ashley Park) and 2 gendarmes, a little dog, an embittered roustabout, a precocious little girl, and so on, each given small parts by way of interaction but none fully realized other than their purpose- as models for his painting. As they assemble for a final arrangement they tease the audience with confidential complaints… I hate this dress, my proportion is wrong, you’re holding my hand too tight, it’s hot, even under a parasol. Act I culminates in a riveting rush as George shifts scenery and people, practically a lecture demonstration of the composition – inexorably building as characters reappear and slip into place, and brought to pulsating life in the show’s title song “Sunday”. And that is where the painting sings! And so does the show. Marie, the now ancient daughter of Dot, has been invited along to an exhibit by her grandson George, an American sculptor, struggling to find a new art form in the same quest for self realization that led his great grandfather to Pointillism. He wants to create a new art form utilizing color-and-light via dispensing machines called chromolumes. 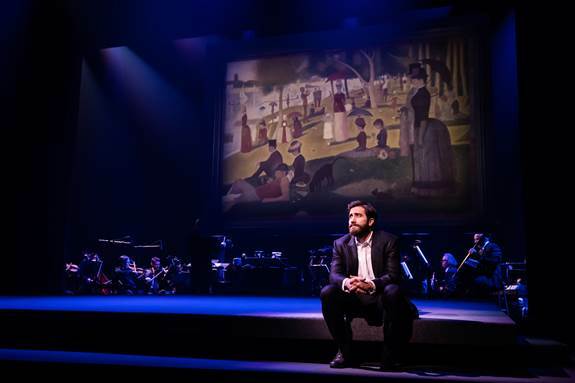 In a contrived and surprisingly sentimental time-traveling segue the Seurat of the first act and his descendant of the second act are guided by the young Dot, who tried to draw Georges into the world he avoided, while Marie wants the modern George to return to his original passion for the work in ”Move on”, Marie’s final plea to George to pick up where his great-grandfather left off, leading into a stunning reprieve of the title song “Sunday”. Tony award winning Annaleigh Ashford once again displays her versatility by playing both young Dot and mature Marie. 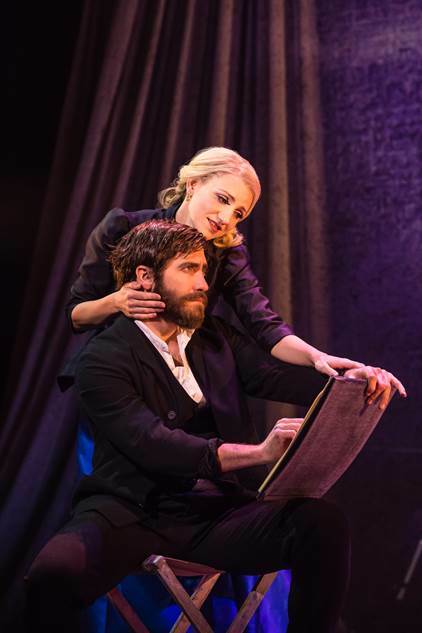 Jake Gyllenhaal conquers the impossibilities of a Sondheim score with verve and ease. It is unfortunate that the role will not be qualified for the Tony it deserves, but his performance will not be forgotten. The orchestra, under the baton of musical director/conductor Chris Fenwick, captures the sharp precision of the first act then delivers the surprisingly lush orchestrations of “Sunday” completing Sondheim’s soaring statement spectacularly. Director Sarna Lapine (James niece) directs with a sure hand. Veteran Light designer Ken Billington never quite captures the quality referred to in the production, perhaps limited by the antiquated theater itself and the overall effect is muted despite efforts of set designer Beowulf Britt, costume designer Clint Ramos, but projection designer Tal Yarden brings it home. The orchestra concludes and plays the audience out, swept along on an irresistible musical wave of art, the artist and artistry. The production won the 1985 Pulitzer Prize for Drama, as well as two Tony Awards for design (and a nomination for Best Musical), numerous Drama Desk Awards, and the 1991 Olivier Award for Best Musical.